The Coordinator of the People and Community Police, Uz. Haidar Mohammed Abdullah, received a delegation from the University of Gezira, included a number of the University leaders, which headed by the Head of Department of Advocacy and Society, Dr. Hatem Ibrahim, the Head of Department of Quran Science, Dr. Musa Tiah Kody, the Head of Training Unit, Uz. Abdul-Gadir Khorshid, and the Head of Unit of Documentation and Publishing, Dr. Mohamed Elfatih El-Mamoun. 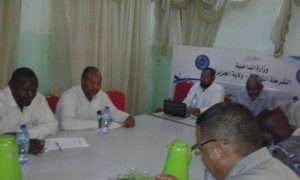 The two sides discussed a number of strategic issues that aim to develop and raise the abilities of the people and community police at the leadership and administrative levels. The meeting approved the development of a firm plan for improving performance and development of skills in a number of axes; (Administrative and policing, community security, training, information and advocacy . Both sides have agreed to the needing for training courses, lectures in the law, raise the sense of security, communication, media, raising capacities and psychology, and other materials that contribute for development. The Coordinator of the People and Community Police, Sheikh Haidar Mohammed Abdullah, appreciated the visit of University of Gezira, stressing its scientific research and societal presence and its contributions to serve the society, which ensured its uniqueness in various fields.